Carijós Indians of the nation Tupi-Guarani were the first inhabitants of Florianópolis area. The traces of its presence are verified through archaeological sites and sambaquis dating up to 4000 years ago. The Indians called the place Meiembipe or "mountain along the channel". Around 1514 the Portuguese landed and gave the area the name Ilha dos Patos, but in 1526 it was renamed Ilha de Santa Catarina (Santa Catarina Island). The area supplied the vessels that went to Bacia da Prata. With the coming of the Captaincy the population began to grow, but the great population growth happened between 1747 and 1756 with the arrival of about 6,000 settlers coming from the Archipelago of Azores and from Madeira Island. The development of the agriculture, the cotton and linen industry and the commerce followed the Azorean occupation. In 1823, still in the monarchic period, Desterro became the Capital of Santa Catarina Province opening a prosperity period with many urban works and also with an intense political organization. Regional elites not happy with the government centralization deflagrated Revolta Federalista (Federalist Revolt) at the beginning of the Brazilian Republic. The movement that started in Rio Grande do Sul spread to Santa Catarina and turned Desterro into the Federalist Capital of the Republic. The then president of Brazil, Marechal Floriano Peixoto, known as Iron Marshal, contained the rebellion and ordered the shooting of many people who were considered enemies of the state, in the Anhatomirim Island Fortress. Possibly to show loyalty to the marshal, 1893 saw the change of the state capital's name: from Desterro to Florianópolis, that is to say, city of Floriano. 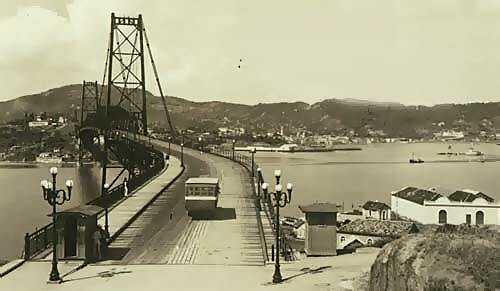 Today, though, the name Florianópolis has almost lost its association with the Marshall. In Florianópolis, the modern joins to the historical and both formed an alliance with the preserved nature composing full scenery of emotion and harmony.